When will California's own spring-predicting desert tortoise finally leave her burrow? 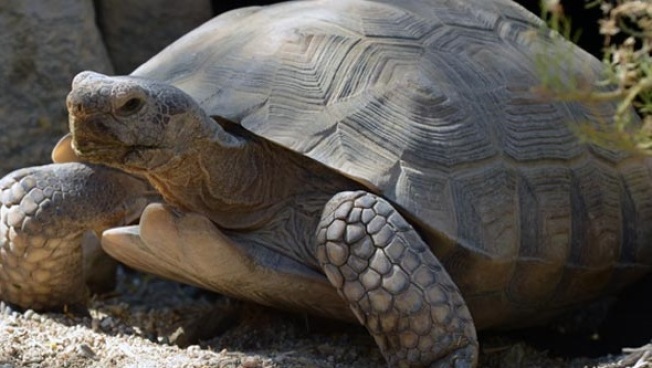 Mojave Maxine, the famous desert tortoise, will end her brumation at The Living Desert in Palm Desert in the coming weeks. But when? A live feed will give fans the moment-by-moment action. A LIVE FEED... that'll allow Maxine fans to keep a minute-by-minute watch on the burrow's entrance/exit. How will you pull yourself away? Keep in mind that Maxine has emerged in recent years around the end of the first week in February, though that could, of course, change. It's all in Maxine's hands (er, claws). Also? Students are invited to enter a contest predicting when we'll see Mojave Maxine for the first time in 2018. Details are here, as well as that riveting live feed. Along with the live cams focused on various eagle nests in the Golden State, area animal enthusiasts have a lot to keep tabs on, during the winter, from the comfort of their computer chair.